Seat ventilation is only available for the front seats. ► To switch on: press button 1 repeatedly until the desired ventilation level is set. If you open the side windows and the sliding sunroof using the SmartKey , the driver's seat ventilation automatically switches to the highest level. : press button 1 repeatedly until all the indicator lamps go out. If the battery voltage is too low, the seat ventilation may switch off. If one or all of the indicator lamps in the seat ventilation button are flashing, the seat ventilation has switched off automatically. The vehicle's electrical system voltage is too low because too many electrical consumers are switched on. ► Switch off electrical consumers that you do not need, such as the rear window defroster or interior lighting. 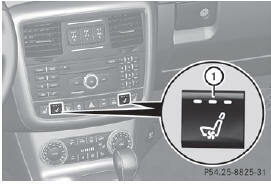 Once the battery is sufficiently charged, the seat ventilation will switch back on automatically.